Place 4 eggs in a saucepan of cold water and set over a high heat. Bring to a boil, then cook for 6 minutes. Turn the heat off and let stand for 2 minutes. Chill under cold running water, then peel and chop. Set aside. 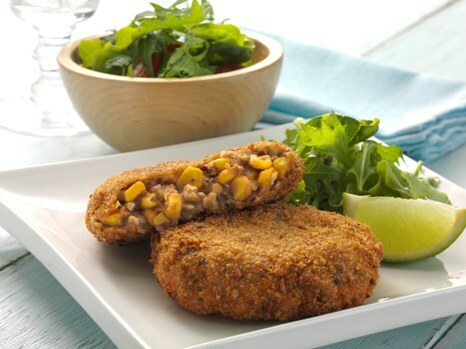 Combine the refried beans, corn, celery and oregano in a large bowl and mix thoroughly. Fold in the chopped eggs gently. Form into 8 patties, then place in the freezer for 1 hour to firm up. Dip the patties in flour, then the remaining beaten eggs, then breadcrumbs. Fry in hot (180 C) vegetable oil for 4 minutes, turning several times, until golden and crisp. Drain on kitchen paper, then serve with light sour cream, lime wedges and salad leaves.